Flowmaster American Thunder Exhaust 15-up Dodge Charger 6.2, 6.4 15-up Dodge Charger 6.4L Flowmaster American Thunder Exhaust Kit, 15-up Dodge Charger 6.2L Hellcat Flowmaster American Thunder Exhaust Kit, 15-up Dodge Charger 6.4L Exhaust System, 15-up Dodge Charger 6.2L Hellcat Exhaust System,Dodge Charger 6.4L [Flowmaster 817684 Exhaust Kit] - $935.95 : 3rd Strike Performance, Your Source for Late Model MOPAR Performance Parts and Accessories! Flowmaster Stainless Steel American Thunder exhaust systems have been designed with the latest exhaust technology available. Through this technology, you will experience improvements in acceleration, passing power, and fuel mileage. The key to these performance improvements is Flowmaster's use of mandrel-bent tubing. Their tubing allows for superior exhaust gas flow, while their stainless steel construction allows for their corrosion-resistant qualities. 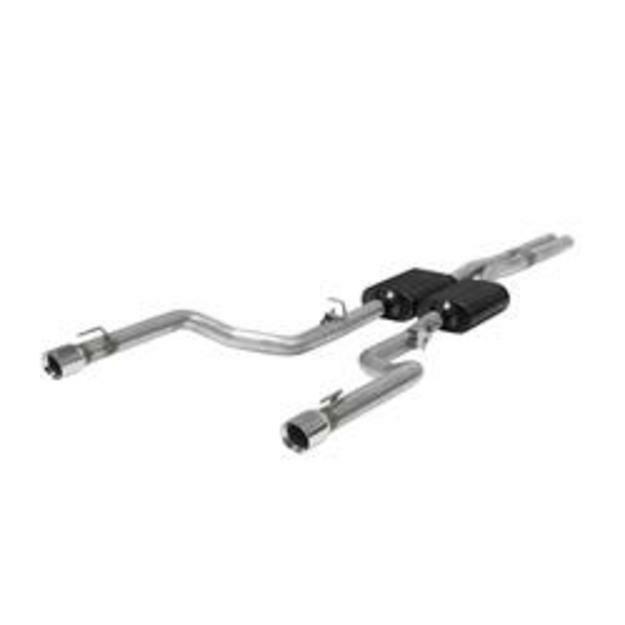 These American Thunder exhaust systems also feature a stainless steel muffler(s) that'll give you plenty of Flowmaster sound.